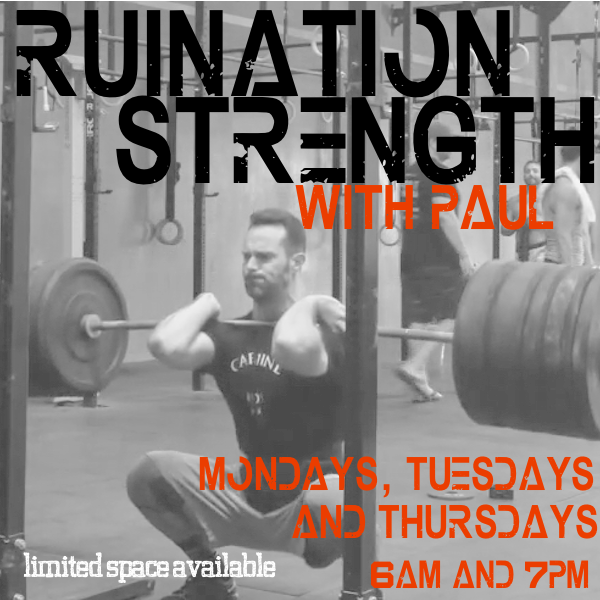 Ruination strength – is a program developed on the three main compound lifts, the squat, the deadlift and the press. This is a program for anyone looking to gain general strength and develop more confidence with the barbell, and other accessory or bodybuilding type of movements. The approach to the program is straight forward, hammer home the importance of mechanics and range of motion, while attacking any physical or mental weakness. Sessions will be small enough in size for lots of coaching and development, as well as creating a solid unit of like minded folks. The program will take up 70% of your weeks workouts, leaving the other 30% for GPP (Crossfit classes). There are two phases to the program. The first phase is a 90 day introductory period, where athletes will learn the ins and outs of the program. From there, athletes will renew as they wish, on a month to month basis. At that point athletes will have a good understanding of max effort lifts, appropriate loading and much, much more. Sessions will meet three days a week: Monday, Tuesday and Thursday at 6am or 7pm. The class will run year long, can be joined at anytime, and students can stick with it as long as they choose. Ruination Strength requires no experience with crossfit or weightlifting and can be joined at anytime.